Okay, so it has been a while – and a couple of states since I last posted! Anyway I am back for today! Life has been so good. We are home from our fantastic trip to North Carolina and we had so much fun! The kids are still talking about all the great things we did and saw and of course playing with the kids! I am happily in my own bed and in my own home. I thoroughly enjoyed the road but it was so good to see our home. I was even happy to see my street and my mean neighbors across the street! And to express Robert’s joy at having us home would be impossible! Last week we tried to recover from living out of suitcases and get readjusted to Central Time Zone and our little reality! It took a week! 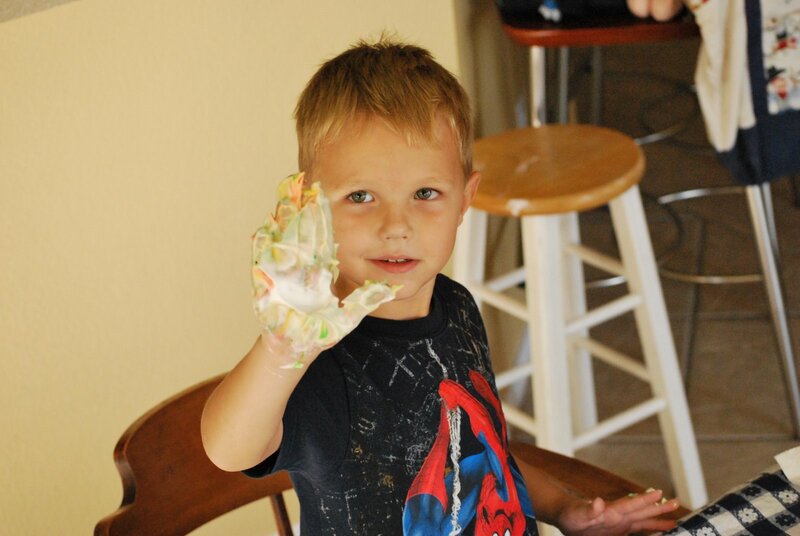 Yesterday was our first REAL “full” day – really morning – of school, and we still had our craft Monday friends over and did a shaving cream craft and had lunch and played. It was a great day. Above you can see “Luke Skywalker” and his friend doing their shavign cream art! The kids loved having their hands in it all and getting diry! Today went so well I think because I was up before Robert left (5:30am) cleaned up the kitchen and had my quiet time before the kids were up! It meant I went to bed at 8:30 but that was great too! This weekend we camped in Cedar Hill again. We went this time with CHEA (our homeschool group) and there were 3 other families. 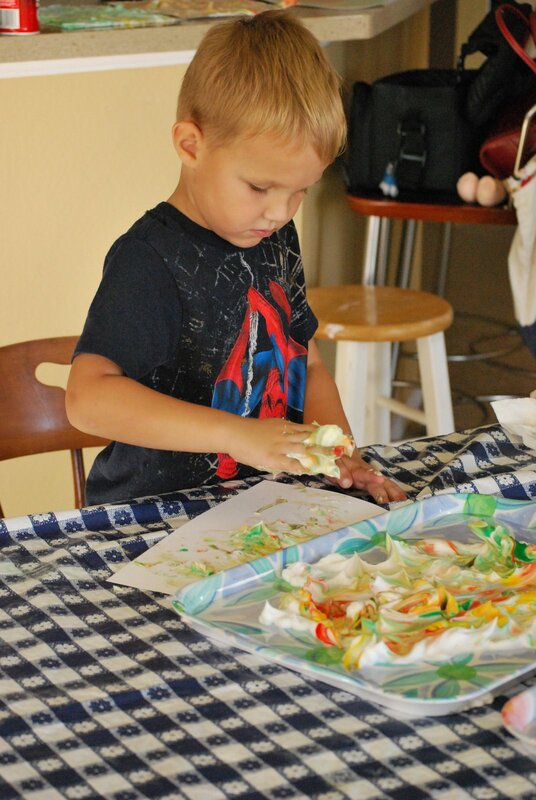 One family, the Myers brought lots of talents along with their balloon animals on Sunday and face painting too! It was a great way to conclude all our fun! On Saturday we learned a lot about Dutch Oven cooking at a demo that the park put on. That day for lunch we enjoyed some great stew (dutch over style) and for dessert that night we “baked” a cobbler in our dutch over! It was great! I feel so blessed to see God working in our lives and those we love. I have been reminded lately of how he allows us to go through the fire sometimes because he wants to change us. We saw a Blacksmith on Saturday too – and he branded a piece of leather to show the kids. I think that when we go through the fire, sometimes it is in order for God to “brand” us by putting his mark on us in a more visible way. I think then we show God through our lives more clearly than when life is good and we are just rolling along. When we go through the fire and it hurts, we either try to gut it out on our own (and usually fail) or we turn to him for comfort, love, and support. I am privileged to be seeing this in some lives right now. One is a fire of friendship and seeing how God is working in that, and how my friend will be a different person on the other side of this. We so often get caught in the moment and how it stinks or hurts, but we forget that in the years to come we will look back and say “Ahhh ha! That was why!” and I have to say those are my most precious parts of my life – now when I see it, but when I look back and the fire and see how God was more at work in my life than before. When I see how he was molding me because I was broken from the fire and how he needed my brokenness to make me more into the woman he wants me to be. Anyway, I am blessed to be seeing God do great things in the lives of those I love. It reminds me more of how he is doing that in my life too! Here are a few final shots of the kids while in Mississippi visiting our family! It was a great visit with lots of catching up and having fun! Adam is playing tag with my boys here and they just loved playing with him! Previous Happy Endings – well kind of….